I remember Hugh teaching me that the secret to really good pulled pork is the oven temperature: it’s crucial that it’s not too hot. A whole pork shoulder is made up of a variety of different muscle sets, some leaner than others. The leaner ones will dry out at temperatures that don’t affect fattier areas. The ultimate goal is to have everything beautifully moist and giving. This is my recipe for the kind of pulled pork you can serve hot in a sandwich at a party, or have with roast potatoes and apple sauce on a Sunday, or in a hash with eggs and mushrooms for breakfast. Place the whole pork shoulder in a large, deep roasting tin (don’t worry if the hock hangs over the edge). Score the skin with a Stanley knife from the top of the shoulder right down to the bottom. Now rub it all over with salt and pepper. 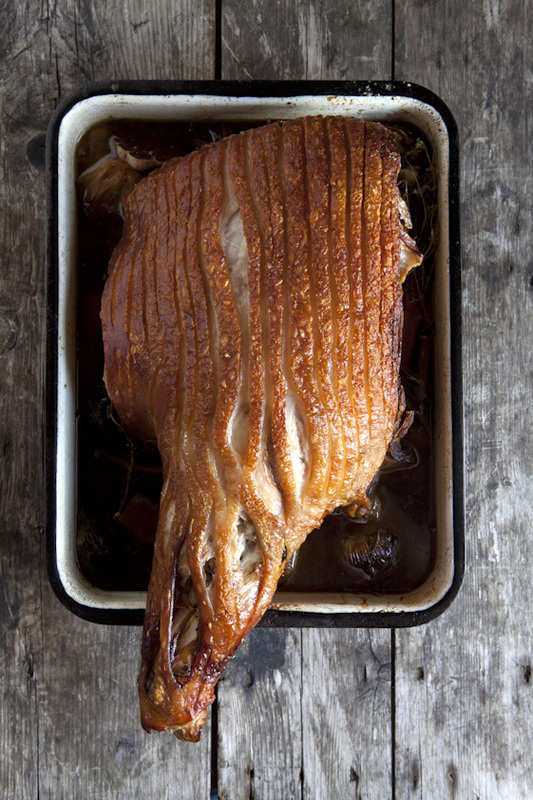 Roast the pork in the oven for 35–40 minutes to get the crackling going. Once it’s golden and crackly, remove the pork and lift it, carefully, on to a board. Add the veg, herbs and garlic to the roasting tin and pour on the water, then return the pork. Now cover the pork with foil, crimping the edges super-tight, to keep the steam in. Return the tin to the oven and turn the setting down to 95°C, Gas 1⁄4. Cook the pork in this very low oven for 12–14 hours (overnight, for convenience). Take the tin from the oven and remove the foil from the pork. You can either bring the shoulder to the table and let everyone ‘pull’ their own pork or do it for them. Lift off the crackling, which will need to be crisped in a hot oven, for 5–10 minutes. Take two forks and start pulling tender chunks of meat away from the bone – it should slip off. Pile the pulled pork into a clean, deep, ovenproof serving dish. Strain the roasting juices, herbs, garlic and veg through a sieve into a warmed bowl, pressing the veg to extract all the flavour. Stir the strained liquor well, then trickle 4–5 ladlefuls over the meat. Season generously with salt and pepper and serve.